Show your true junker self with this #trashure campfire mug. Made to look like my favorite farmhouse enamelware, but is made of ceramic. Fun! See full description below. Shipping & Handling: $7.75. Please read our Terms of Service for details. Local pickup is also available. Please contact us for more information. Show your true junker self with this #trashure campfire mug. 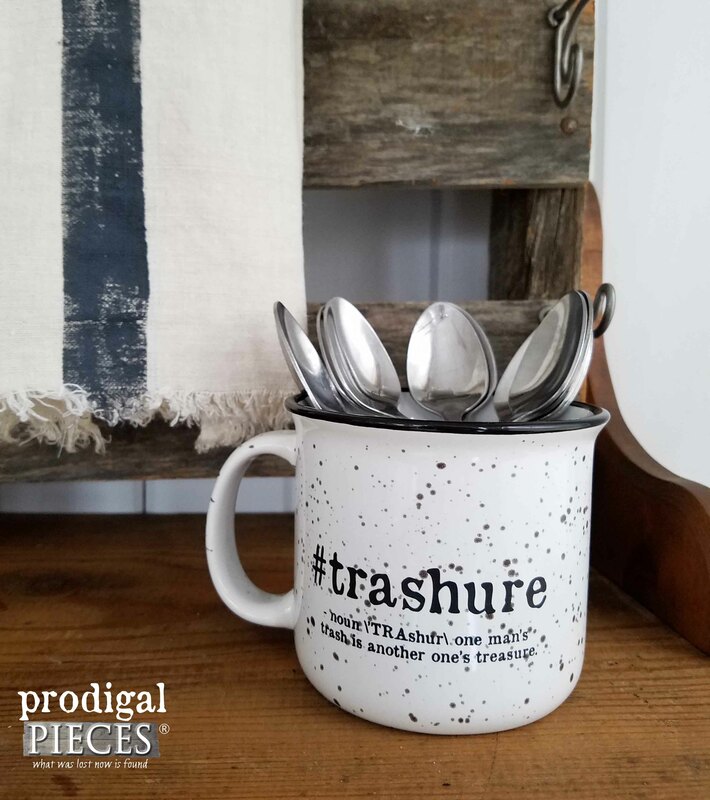 Made to look like my favorite farmhouse enamelware, but is made of high-quality ceramic. Fun! Large 15 oz. 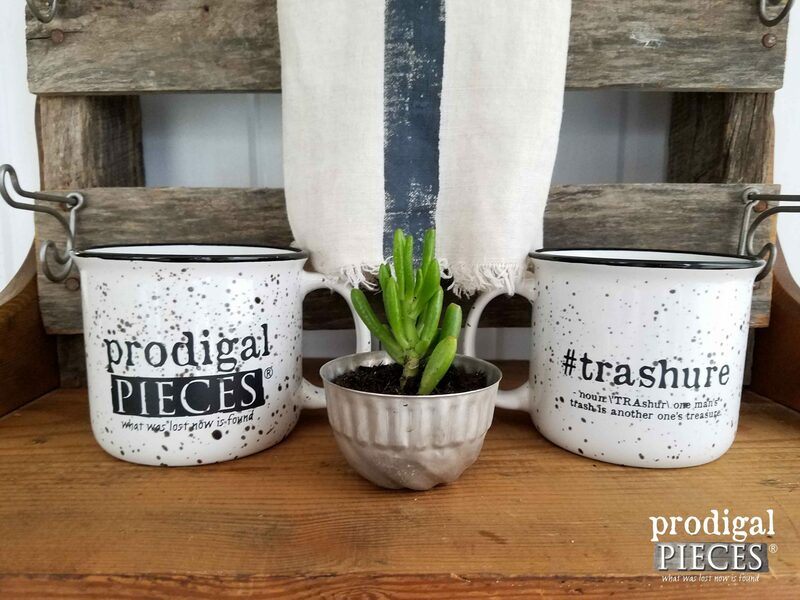 size is perfect for your morning cup of joe, a desk organizer, or even to plant some fun succulents. Or, better yet, fill it with goodies and gift to a junkin’ friend. 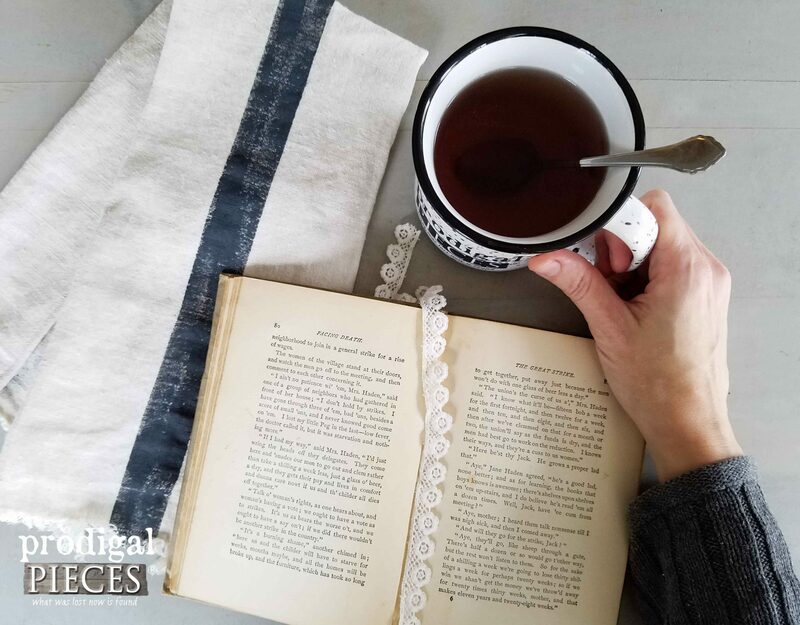 This whimsical piece will make a perfect addition to your farmhouse, industrial, primitive, cottage chic, flea market, vintage eclectic, or country décor. In addition, it has a two-sided design (logo on back, and trashure on front). Micro-wave, dishwasher safe. Share your #trashure selfie on Instagram with your repurposed creations! Oh my gosh! I love this mug so much!! It feels great in my hand! My hubby said you are so clever! I can’t wait till tomorrow morning for my coffee.? Thank you Larissa!! Excellent! I’m so happy to hear it. Thank you! I absolutely LOVE this mug! All that enamelware goodness that can go in the microwave if needed! It really holds a lot and is holding up well so far. I have had it for about 3 months. Wonderful to hear, Carole! Thank you. Just received my Trashure mug this week. delivery was prompt, Larissa was super responsive to my order, and I couldn’t be happier with the mug. It’s well made and just what my morning coffee needed. Will definitely be my camping mug of choice this year. Love this mug! It’s big enough for soup but small enough to still use for coffee. I’m so happy to hear it, Lindsey. Thank you! I won one of these mugs in a giveaway Larissa held, and it has been my morning go to mug ever since! I prefer bigger coffee mugs, but if you go too big, temperature regulation becomes an issue, but not with this mug! This is a great 15 oz cup that keeps my coffee hot much longer than other large ones I’ve tried. Plus, on a personal note, I love the lip the mug! Like, I said, it’s my go to mug and I just adore it! Thanks so much, Larissa! What a treat to hear! I love them too, but definitely love to hear what others think too. Thank you, Jen! I absolutely am in love with this mug! 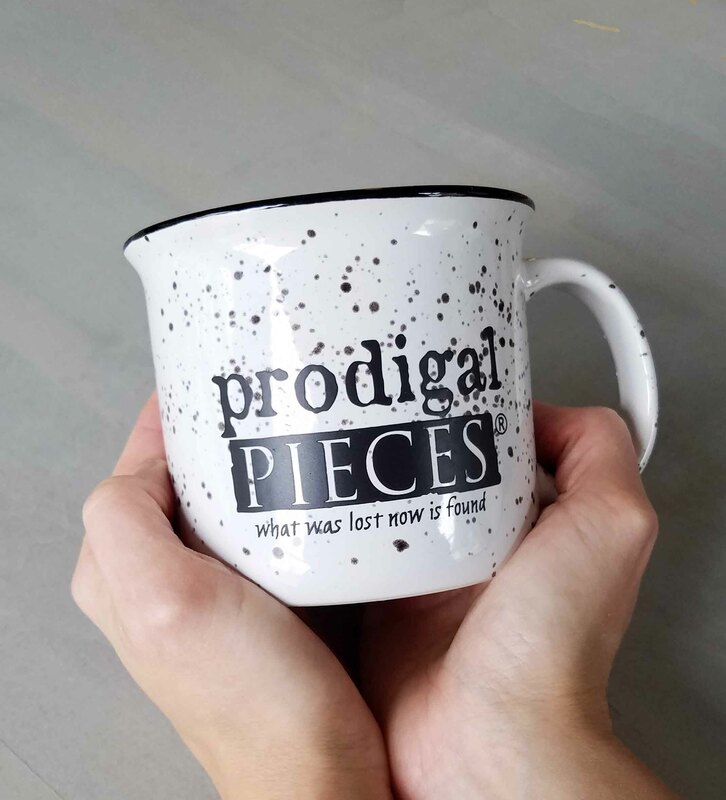 I won it in a giveaway celebrating Larissa’s 50,000th fan and that alone was exciting because I never win anything., but the mug itself is a gem. 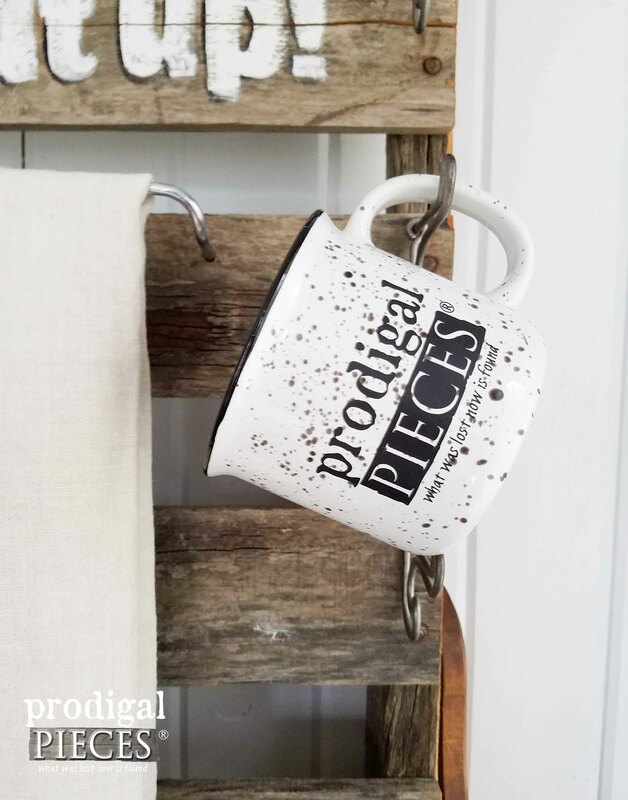 I only drink one cup of coffee a day so I like a bigger mug and this is perfect, not so large or heavy that it needs two hands I love the rustic spatterware look and the Trashure definition fits my philosophy so well. I’ve used it every day for my coffee since receiving it. Thanks again! That is so wonderful to hear, Laurie! I’m thankful we can offer them in our shop. Hugs! Got my mug it’s awesome nice and hefty can’t wait for cold weather for my hot chocolate !